James Meier is a Majority Owner and CEO in ProClad Systems LLC (www.procladsystems.com). He has a BS in Ceramic Engineering from Clemson University and has 27 years’ experience in the refractory and insulation markets. He has worked for such companies as Morgan Thermal Ceramics, Microtherm, and Aspen Aerogels. He has experience in the design and recommendation of products for the Petrochemical, Military, and Fire Protection Markets. He is an active member of ASTM, Cryogenic Society of America, and NIA, along with other local community organizations. He can be reached at jim@procladsystems.com. A proposed ASTM standard may bring a relatively unknown insulation jacket material into more projects in the United States. 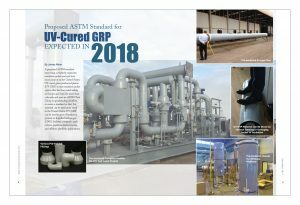 UV-cured glass-reinforced plastic (UV-GRP) is one insulation jacket option that has been used widely in Europe and Asia for more than a decade, and now an ASTM Task Group is spearheading an effort to create a standard so that this material can be used more easily in the United States. 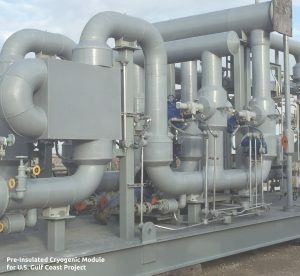 UV-GRP can be used as part of insulation systems in liquefied natural gas (LNG) facilities, cryogenic applications, pipelines, buried piping, and offshore platform applications. UV-GRP is supplied in uncured rolls or in pre-formed cured pieces. The uncured rolls cure in sunlight at ambient temperatures, so contractors can shape it on site much more easily, potentially leading to lower fabrication and installation cost. It can be easily fabricated in a shop or in the field into 90s, tees, tank heads, and other complicated shapes. It is also highly chemical resistant, so it is useful in applications where it may come into direct contact with cryogen. While the material does help keep water out, it is not recommended as a primary vapor barrier, but as an outer jacketing that can help prevent corrosion and damage. 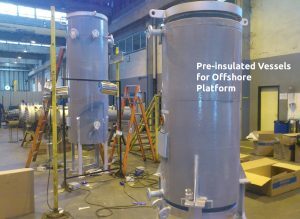 For cold applications, including below ambient and cryogenic, a double-barrier system consisting of a system-appropriate insulation, a primary vapor barrier, and then UV-GRP, is commonly used. 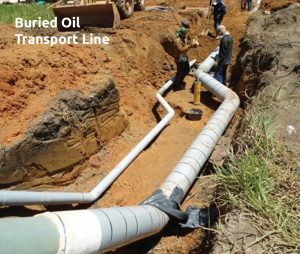 This design can lead to a longer system life and helps prevent water from penetrating the system and potentially causing corrosion. The uncured rolls of GRP are sticky on the application side, so it adheres well to steel terminations and other equipment, thus helping seal the system. As many engineers, managers, and mechanical insulation contractors know, insulation is often damaged by being walked on. UV-GRP is resistant to damage and is able to withstand walking or other contact without denting. It is typically delivered in thicknesses between 1–2.5 mm (1/32” up to 3/32”) on rolls 24 or 39” inches wide. Its high emittance—it has an emissivity of .8 versus .1 for aluminum—may also allow for thinner insulation design, which can be helpful in tight spaces (see Figure 1). 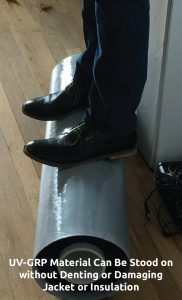 lines where leaks in the pipe may occur, it is recommended that weep holes be put into the jacketing. UV-GRP has been used on systems as low as -196°C all the way up to process piping up to 600°C. Please consult a UV-GRP distributor or manufacturer for physical properties pertaining to hot terminations. Typical UV-GRP has an upper continuous use limit of 120°C. UV-GRP is covered in the European Committee Industrial Insulation (CINI) standards, and it has been widely used internationally. International companies experience difficulty in translating the European standards when building facilities in America, which is why there is currently an effort underway to create an ASTM standard for this material. Those interested in creating this standard, including myself, created ASTM Task Group 41433 through the C16 committee to try to come up with a standard for this product. This standard includes flame and smoke properties, UV resistance, and temperature (see Figure 2 on page 14). The group is hoping to go to committee ballot before the next meeting in April 2018. Then, the proposal would go back through the main ASTM committee for comment—if it passed this stage, it would then become a standard. Product should meet ASTM E84 25/50 Smoke and Flame. Product should meet ASTM E1317 and be non-dripping and should not support flames. Regarding UV degradation—for any outdoor use it is highly recommend that UV-GRP products pass accelerate weathering to ASTM G154 Standards. Fittings and straights should comply with ASTM C450 and C585. Material should be free from defects (air pockets, holes, etc.) and meet dimensional tolerances. 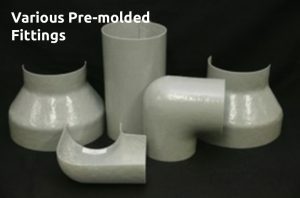 Temperature resistance—UV-GRP products are thermoset resins and as such do not melt, but char. It is important to get good temperature resistance data and testing from your supplier. Product should also pass the ASTM D746 brittleness test and ASTM D648 heat deflection temperature. Given the positive outlook for LNG, there is likely to be an increase in demand for products suited for these applications. 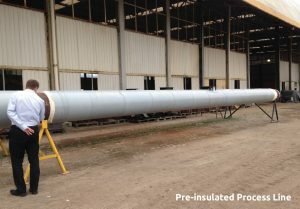 In combination with the right insulation and primary vapor barrier, UV-GRP is an option that can withstand corrosion, cryogenic temperatures, and foot traffic. Creating an ASTM standard for this material will help ensure it is used properly in facilities throughout the United States. This article was published in the December 2017 issue of Insulation Outlook magazine. Copyright © 2017 National Insulation Association. All rights reserved. The contents of this website and Insulation Outlook magazine may not be reproduced in any means, in whole or in part, without the prior written permission of the publisher and NIA. Any unauthorized duplication is strictly prohibited and would violate NIA’s copyright and may violate other copyright agreements that NIA has with authors and partners. Contact publisher@insulation.org to reprint or reproduce this content.